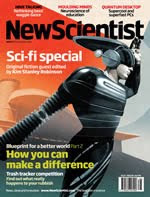 The September 19th issue of London-based popular science magazine New Scientist is a special section, "Sci-fi special: The fiction of now"*, guest edited by Kim Stanley Robinson. I don't feel like I know enough to either agree or disagree with Robinson's assessment of British science fiction. I would agree with him, however, that the British SF writers who contributed flash fiction to the special issue are excellent. Justina Robson's story "One Shot" is the only completely biological one of the bunch, but it's worth spending the short time it takes to read them all. And if you think you could do better, enter New Scientist's Flash fiction competition with your story or 350 words or less. * New Scientist unfortunately seem to have missed the memo that some consider SciFi a dirty word - perhaps the hyphen removes the sting? Justina's is actually the pick of the bunch.